Chihuahuas may be small, but Chihuahua temperament is definitely larger than life. Chihuahuas are pint-sized pooches packed with personality. The Chihuahua temperament is mostly determined by that of their parents and by how they are raised. The Chihuahua breed is one of the dog breeds that are known to have a good temperament. Their good temperament allows these dogs to work well as human companions. These dogs are enterprising, proud, spirited and brave. Though these dogs are affectionate, they can sometimes be manipulative. Before you adopt one of these dogs, it is important to understand the various redeeming qualities that these dogs possess in order to determine whether this is what you want from your canine companion. Though Chihuahuas love to give, they too demand the affection and attention of their owners. As long as you treat this dog right, they will return the love and remain attached to the members of the family. If you love dogs that are small and easy to carry, available in different sizes, colors, and coats, one that is humorous and engaging in peculiar ways, one that does not need too much exercise, lives long and is a great watchdog, then the Chihuahua might be the right choice for you. Let’s take a closer look at the components of the Chihuahua temperament and personality. To minimize the Chihuahua temperament problems or traits that you do not like, you can choose the right puppy from a good and reputable breeder. If you adopt an adult Chihuahua, you should choose one with the most positive temperament or traits. You can do this by spending some time observing the dog and talking to those who have interacted with it the most in the past, such as a foster parent. This breed can sometimes be dangerous if you have young children because the Chihuahua dog can sometimes be pretty jealous. They can also be threatening, suspicious and noisy to strangers. If the stranger is not insistent and pushy the dog can approach them at its own time. Most dogs in this breed are only friendly to their masters and other members of the family. They are known to be quick at checking out for action though they are also good at avoiding taking part in the actual action. The other factor that you should be concerned about, if you are considering owning a Chihuahua, is to socialize it so as not to threaten strangers. Since Chihuahuas are suspicious in nature, it is important that you give yours enough exposure. This exposure should be to people and unusual sounds and sights. This will prevent this natural suspicion from becoming downright nasty or shrill. 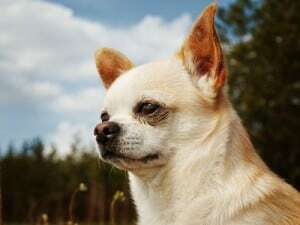 The devoted Chihuahua temperament makes this breed completely loyal to their “person” but naturally wary of strangers. 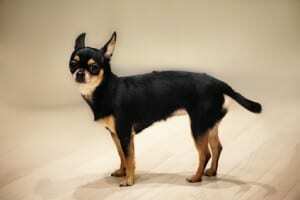 The quick and alert Chihuahua temperament certainly makes this breed a good little watchdog. However, it is important not to let these Chihuahua traits get out of hand. Socialization is a key component to raising a friendly and confident Chihuahua. Chihuahuas are peaceful to other pets in the family but they tend to raise a ruckus in the presence of strange pets. This temperament should be discouraged at an early stage. These dogs are friendly to others of the same breed so if possible it is advisable to keep more than one Chihuahua in your home. Since they are obsessive ear lickers they will clean each other’s ears and play together. They also like keeping each other warm but when they are alone they are likely to seek that warmth from your couch or bed. If you are comfortable with Chihuahua temperament and are sure that this is the right breed for you, then you should understand their fragility. They fall in the toy dog category for a good reason. Dogs in this breed are incredibly fragile and you should be cautions when handling them. You can easily injure or kill them by stepping on them. Before sitting on the couch make sure that the dog is nowhere near. Because of this fragility, you should protect them from other bigger dogs. Chihuahuas are toy breeds that must be kept in close and constant surveillance and supervision. It is always advisable to keep the dog on leash. The Chihuahua should also be kept away from young children to avoid accidents such as being stepped on rolled on, squeezed on, dropped onto the patio or even being sat on. The loud noises and quick movements made by children are also likely to give the dog stress and fear. If you are considering adopting a Chihuahua, you should also consider their housebreaking issues. Most behavioral dog consultants, rank these dogs on the top five lists of dogs that are hard to housebreak. Housebreaking is even harder for the Chihuahua if you live in rainy or cold climates. This is because these dogs hate the rain and cold climates. However, if you live in such areas and must own a Chihuahua, you can have a covered potty. If you work long hours, you may need to get a doggie door or put down pee pads for your Chihuahua. Another solution would be to hire a dog walker to let your dog out in the middle of the day. Although some people might have a personal preference, most professionals feel that there are no major differences between the genders. Try to be open to both males and females when choosing the right pet for your family. The Chihuahua is one of the smallest dog breeds in the canine kingdom. The average Chihuahua weight is between 3 and 6 lbs. The average Chihuahua height is between 5 and 8 inches. Chihuahua colors can come in any color- solid, marked or splashed. A coloration called “double merle” is not encouraged though because it often leads to genetic vision and hearing issues. The Chihuahua coat comes in two varieties—longhaired and shorthaired. The longhaired Chihuahua requires more grooming than the shorthaired variety. The shorthaired Chihuahua simply needs occasional brushing and bathing. Whereas, the longhaired Chihuahua needs more frequent brushing and trimming. The fur behind the ears and legs can easily become matted without diligent grooming. The history of the Chihuahua dog dates back to the early civilizations of South America. It is believed that the Aztecs created the breed in the 12th century. The American Kennel Club inducted the Chihuahua into the Toy Group in 1908. Training your Chihuahua is very important. Training helps create a strong bond between you and your dog. It also helps your dog develop into a polite canine citizen. Enroll in a positive reinforcement training class at the earliest opportunity. A group class is a great way for your Chihuahua to receive socialization with other dogs and people. Make sure your trainer uses positive, force-free methods. Rough handling is not advised with these delicate dogs. If you are struggling with Chihuahua temperament problems, such as barking or nipping, consult with a professional positive reinforcement trainer right away. As with all dogs, providing adequate exercise is an important part of successful training. Remember, a tired dog is a good dog! Chihuahua exercise can take the form of walking, jogging, playing fetch in the yard or in the house. This breed does not require excessive exercise, but a little of daily activity is necessary. For help with training your Chihuahua take a look at The Online Dog Trainer by Doggy Dan. Doggy Dan is an expert Dog Trainer based in New Zealand. His online resource contains Hundreds of Excellent Dog Training Videos that will take you step-by-step through the process of developing a healthy, happy well-behaved dog. Like all dogs, your Chihuahua should visit the veterinarian at least once per year for a physical exam and annual vaccinations. Your Chihuahua should also be on flea, heartworm and tick prevention at all times. Spaying and neutering is highly encouraged for health reasons, behavior reasons, and to avoid further overpopulation of the breed. Chihuahuas are one of the most common breeds of dogs in animal shelters. Please be a responsible owner and spay or neuter your pet. With good care, the Chihuahua lifespan can be as long as 18 years! These little dogs can live a very long time, so make sure you are prepared for a lifetime commitment if you get a Chihuahua as a puppy. Note: if you agree that your health and your dog's health should be a top priority then get a copy of The Ultimate Guide to Dog Health. Your Chihuahua friend will love you for it. This guide will help save you money, time and most of all help you keep your dog healthy. friend will love you for it. This guide will help save you money, time and most of all help you keep your dog healthy. If you would like to add a Chihuahua to your family, please look into adoption options first. Sadly, shelters and rescue groups are inundated with homeless Chihuahuas. Chihuahuas were a “fad” in the early 2000s. Movies such as Legally Blonde and celebrities such as Paris Hilton created a sudden demand for these dogs. But like all fads, the Chihuahua craze ended. Today, animal shelters are filled with unwanted Chihuahuas. Most of these Chihuahuas are friendly and healthy little dogs. They just need someone to give them a second chance. Ask the staff if you can fill out an application and be notified when Chihuahuas become available for adoption. You can also search for your perfect Chihuahua online. Use Google and Facebook to research Chihuahua rescue groups or Toy Breed rescue groups. You can also search for adoptable Chihuahuas on Petfinder.com, Adoptapet.com or Getyourpet.com. These sites will allow you to set notifications so you can be notified by email when new Chihuahuas become available in your local area. If you acquire your new pet through an adoption agency, the adoption fee will likely be between $25 and $300 depending on the organization and age of the dog. Your adoption fee will usually include spay/neuter, vaccinations, and basic vetting. If you decide to purchase a Chihuahua puppy from a breeder, make sure you do diligent research to make sure that you are acquiring your pet from an ethical source. Never purchase Chihuahua puppies over the internet or from pet stores. These puppies usually come from puppy mills and backyard breeders. 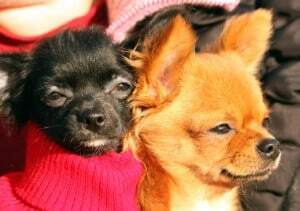 Instead, contact the Chihuahua Club of America and ask for referrals of quality Chihuahua breeders in your area. Once you identify a possible breeder, make an appointment to visit the breeder in person. Ask to meet the breeding dogs and view their medical records. The breeder should welcome your visit. They will want to ask you questions as well. A good breeder wants to make sure that their puppies go to the best possible homes. If a breeder does not allow you to visit the premises, this is a red flag. Keep looking for alternatives. If you purchase your Chihuahua through a high-quality breeder, the Chihuahua price will be between $800 and $1500. Certain varieties may cost as much as $2500. If you are thinking seriously about adopting a Chihuahua, make sure you learn all you can about Chihuahua temperament and training. Talk with current Chihuahua owners about the best and worst Chihuahua behaviors. The Chihuahua Club of America is a great place to find more Chihuahua temperament information. As stated above the Chihuahua is part of the Toy Group of dogs. The one thing dogs in this group have in common is their size. Although other groups have small dogs this is the only group with exclusively small dogs. And small size matters when it comes to dog ownership. Next post: The Dalmatian Temperament (Energetic, Outgoing): Is It A Great Dog for the Novice Dog Owner?